Indonesian and U.S. students participating in an educational videoconference (2010). This technique was very expensive, though, and could not be used for applications such as telemedicine, distance education, and business meetings. Attempts at using normal telephony networks to transmit slow-scan video, such as the first systems developed by AT&T Corporation, first researched in the 1950s, failed mostly due to the poor picture quality and the lack of efficient video compression techniques. The greater 1 MHz bandwidth and 6 Mbit/s bit rate of the Picturephone in the 1970s also did not achieve commercial success, mostly due to its high cost, but also due to a lack of network effect —with only a few hundred Picturephones in the world, users had extremely few contacts they could actually call to, and interoperability with other videophone systems would not exist for decades. It was only in the 1980s that digital telephony transmission networks became possible, such as with ISDN networks, assuring a minimum bit rate (usually 128 kilobits/s) for compressed video and audio transmission. During this time, there was also research into other forms of digital video and audio communication. Many of these technologies, such as the Media space, are not as widely used today as videoconferencing but were still an important area of research. The first dedicated systems started to appear in the market as ISDN networks were expanding throughout the world. One of the first commercial videoconferencing systems sold to companies came from PictureTel Corp., which had an Initial Public Offering in November, 1984. In 1984 Concept Communication in the United States replaced the then-100 pound, US$100,000 computers necessary for teleconferencing, with a $12,000 circuit board that doubled the video frame rate from 15 up to 30 frames per second, and which reduced the equipment to the size of a circuit board fitting into standard personal computers. The company also secured a patent for a codec for full-motion videoconferencing, first demonstrated at AT&T Bell Labs in 1986. Global Schoolhouse students communicating via CU-SeeMe, with a video framerate between 3-9 frames per second (1993). Videoconferencing systems throughout the 1990s rapidly evolved from very expensive proprietary equipment, software and network requirements to a standards-based technology readily available to the general public at a reasonable cost. Finally, in the 1990s, Internet Protocol-based videoconferencing became possible, and more efficient video compression technologies were developed, permitting desktop, or personal computer (PC)-based videoconferencing. In 1992 CU-SeeMe was developed at Cornell by Tim Dorcey et al. In 1995 the first public videoconference between North America and Africa took place, linking a technofair in San Francisco with a techno-rave and cyberdeli in Cape Town. At the Winter Olympics opening ceremony in Nagano, Japan, Seiji Ozawa conducted the Ode to Joy from Beethoven's Ninth Symphony simultaneously across five continents in near-real time. While videoconferencing technology was initially used primarily within internal corporate communication networks, one of the first community service usages of the technology started in 1992 through a unique partnership with PictureTel and IBM Corporations which at the time were promoting a jointly developed desktop based videoconferencing product known as the PCS/1. Over the next 15 years, Project DIANE (Diversified Information and Assistance Network) grew to utilize a variety of videoconferencing platforms to create a multi-state cooperative public service and distance education network consisting of several hundred schools, neighborhood centers, libraries, science museums, zoos and parks, public assistance centers, and other community oriented organizations. 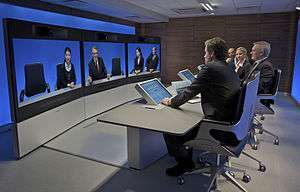 Technological developments by videoconferencing developers in the 2010s have extended the capabilities of video conferencing systems beyond the boardroom for use with hand-held mobile devices that combine the use of video, audio and on-screen drawing capabilities broadcasting in real-time over secure networks, independent of location. Mobile collaboration systems now allow multiple people in previously unreachable locations, such as workers on an off-shore oil rig, the ability to view and discuss issues with colleagues thousands of miles away. Traditional videoconferencing system manufacturers have begun providing mobile applications as well, such as those that allow for live and still image streaming. The core technology used in a videoconferencing system is digital compression of audio and video streams in real time. The hardware or software that performs compression is called a codec (coder/decoder). Compression rates of up to 1:500 can be achieved. The resulting digital stream of 1s and 0s is subdivided into labeled packets, which are then transmitted through a digital network of some kind (usually ISDN or IP). The use of audio modems in the transmission line allow for the use of POTS, or the Plain Old Telephone System, in some low-speed applications, such as videotelephony, because they convert the digital pulses to/from analog waves in the audio spectrum range. Large group videoconferencing are non-portable, large, more expensive devices used for large rooms and auditoriums. Small group videoconferencing are non-portable or portable, smaller, less expensive devices used for small meeting rooms. Individual videoconferencing are usually portable devices, meant for single users, have fixed cameras, microphones and loudspeakers integrated into the console. Desktop systems are add-ons (hardware boards or software codec) to normal PCs and laptops, transforming them into videoconferencing devices. A range of different cameras and microphones can be used with the codec, which contains the necessary codec and transmission interfaces. Most of the desktops systems work with the H.323 standard. Videoconferences carried out via dispersed PCs are also known as e-meetings. These can also be nonstandard, Microsoft Lync, Skype for Business, Google Hangouts, or Yahoo Messenger or standards based, Cisco Jabber. The components within a Conferencing System can be divided up into several different layers: User Interface, Conference Control, Control or Signal Plane, and Media Plane. Conference Control performs resource allocation, management and routing. This layer along with the User Interface creates meetings (scheduled or unscheduled) or adds and removes participants from a conference. The Media Plane controls the audio and video mixing and streaming. This layer manages Real-Time Transport Protocols, User Datagram Packets (UDP) and Real-Time Transport Control Protocol (RTCP). The RTP and UDP normally carry information such the payload type which is the type of codec, frame rate, video size and many others. RTCP on the other hand acts as a quality control Protocol for detecting errors during streaming. Simultaneous videoconferencing among three or more remote points is possible by means of a Multipoint Control Unit (MCU). This is a bridge that interconnects calls from several sources (in a similar way to the audio conference call). All parties call the MCU, or the MCU can also call the parties which are going to participate, in sequence. There are MCU bridges for IP and ISDN-based videoconferencing. There are MCUs which are pure software, and others which are a combination of hardware and software. An MCU is characterised according to the number of simultaneous calls it can handle, its ability to conduct transposing of data rates and protocols, and features such as Continuous Presence, in which multiple parties can be seen on-screen at once. MCUs can be stand-alone hardware devices, or they can be embedded into dedicated videoconferencing units. In VAS mode, the MCU switches which endpoint can be seen by the other endpoints by the levels of one's voice. If there are four people in a conference, the only one that will be seen in the conference is the site which is talking; the location with the loudest voice will be seen by the other participants. Continuous Presence mode, displays multiple participants at the same time. The MP in this mode takes the streams from the different endpoints and puts them all together into a single video image. In this mode, the MCU normally sends the same type of images to all participants. Typically these types of images are called "layouts" and can vary depending on the number of participants in a conference. Cloud-based video conferencing can be used without the hardware generally required by other video conferencing systems, and can be designed for use by SMEs, or larger international companies like Facebook. Cloud-based systems can handle either 2D or 3D video broadcasting. Cloud-based systems can also implement mobile calls, VOIP, and other forms of video calling. They can also come with a video recording function to archive past meetings. The issue of eye-contact may be solved with advancing technology, and presumably the issue of appearance consciousness will fade as people become accustomed to videoconferencing. The Unified Communications Interoperability Forum (UCIF), a non-profit alliance between communications vendors, launched in May 2010. The organization's vision is to maximize the interoperability of UC based on existing standards. Founding members of UCIF include HP, Microsoft, Polycom, Logitech/LifeSize Communications and Juniper Networks. High speed Internet connectivity has become more widely available at a reasonable cost and the cost of video capture and display technology has decreased. Consequently, personal videoconferencing systems based on a webcam, personal computer system, software compression and broadband Internet connectivity have become affordable to the general public. Also, the hardware used for this technology has continued to improve in quality, and prices have dropped dramatically. The availability of freeware (often as part of chat programs) has made software based videoconferencing accessible to many. the expense or time of travel is a consideration. Deaf, hard-of-hearing and mute individuals have a particular interest in the development of affordable high-quality videoconferencing as a means of communicating with each other in sign language. Unlike Video Relay Service, which is intended to support communication between a caller using sign language and another party using spoken language, videoconferencing can be used directly between two deaf signers. Complexity of systems. Most users are not technical and want a simple interface. In hardware systems an unplugged cord or a flat battery in a remote control is seen as failure, contributing to perceived unreliability which drives users back to traditional meetings. Successful systems are backed by support teams who can pro-actively support and provide fast assistance when required. Perceived lack of interoperability: not all systems can readily interconnect, for example ISDN and IP systems require a gateway. Popular software solutions cannot easily connect to hardware systems. Some systems use different standards, features and qualities which can require additional configuration when connecting to dissimilar systems. 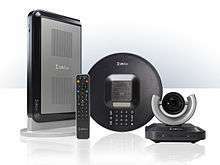 Expense of commercial systems: well-designed telepresence systems require specially designed rooms which can cost hundreds of thousands of dollars to fit out their rooms with codecs, integration equipment (such as Multipoint Control Units), high fidelity sound systems and furniture. Monthly charges may also be required for bridging services and high capacity broadband service. Self-consciousness about being on camera: especially for new users or older generations who may prefer less fidelity in their communications. Lack of direct eye contact, an issue being circumvented in some higher end systems. These are some of the reasons many systems are often used for internal corporate use only, as they are less likely to result in lost sales. One alternative to companies lacking dedicated facilities is the rental of videoconferencing-equipped meeting rooms in cities around the world. Clients can book rooms and turn up for the meeting, with all technical aspects being prearranged and support being readily available if needed. In a military investigation in State of North Carolina, Afghan witnesses have testified via videoconferencing. The U.S. Social Security Administration (SSA), which oversees the world's largest administrative judicial system under its Office of Disability Adjudication and Review (ODAR), has made extensive use of videoconferencing to conduct hearings at remote locations. In Fiscal Year (FY) 2009, the U.S. Social Security Administration (SSA) conducted 86,320 videoconferenced hearings, a 55% increase over FY 2008. In August 2010, the SSA opened its fifth and largest videoconferencing-only National Hearing Center (NHC), in St. Louis, Missouri. This continues the SSA's effort to use video hearings as a means to clear its substantial hearing backlog. Since 2007, the SSA has also established NHCs in Albuquerque, New Mexico, Baltimore, Maryland, Falls Church, Virginia, and Chicago, Illinois. Videoconferencing provides students with the opportunity to learn by participating in two-way communication forums. Furthermore, teachers and lecturers worldwide can be brought to remote or otherwise isolated educational facilities. Students from diverse communities and backgrounds can come together to learn about one another, although language barriers will continue to persist. Such students are able to explore, communicate, analyze and share information and ideas with one another. Through videoconferencing, students can visit other parts of the world to speak with their peers, and visit museums and educational facilities. Such virtual field trips can provide enriched learning opportunities to students, especially those in geographically isolated locations, and to the economically disadvantaged. Small schools can use these technologies to pool resources and provide courses, such as in foreign languages, which could not otherwise be offered. Videoconferencing is a highly useful technology for real-time telemedicine and telenursing applications, such as diagnosis, consulting, transmission of medical images, etc... With videoconferencing, patients may contact nurses and physicians in emergency or routine situations; physicians and other paramedical professionals can discuss cases across large distances. Rural areas can use this technology for diagnostic purposes, thus saving lives and making more efficient use of health care money. For example, a rural medical center in Ohio, United States, used videoconferencing to successfully cut the number of transfers of sick infants to a hospital 70 miles (110 km) away. This had previously cost nearly $10,000 per transfer. 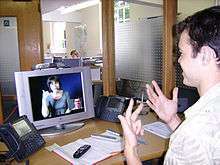 A video relay service (VRS), also known as a 'video interpreting service' (VIS), is a service that allows deaf, hard-of-hearing and speech-impaired (D-HOH-SI) individuals to communicate by videoconferencing (or similar technologies) with hearing people in real-time, via a sign language interpreter. A similar video interpreting service called video remote interpreting (VRI) is conducted through a different organization often called a "Video Interpreting Service Provider" (VISP). VRS is a newer form of telecommunication service to the D-HOH-SI community, which had, in the United States, started earlier in 1974 using a non-video technology called telecommunications relay service (TRS). One of the first demonstrations of the ability for telecommunications to help sign language users communicate with each other occurred when AT&T's videophone (trademarked as the "Picturephone") was introduced to the public at the 1964 New York World's Fair –two deaf users were able to communicate freely with each other between the fair and another city. Various universities and other organizations, including British Telecom's Martlesham facility, have also conducted extensive research on signing via videotelephony. The use of sign language via videotelephony was hampered for many years due to the difficulty of its use over slow analogue copper phone lines, coupled with the high cost of better quality ISDN (data) phone lines. Those factors largely disappeared with the introduction of more efficient video codecs and the advent of lower cost high-speed ISDN data and IP (Internet) services in the 1990s. VRS services have become well developed nationally in Sweden since 1997 and also in the United States since the first decade of the 2000s. With the exception of Sweden, VRS has been provided in Europe for only a few years since the mid-2000s, and as of 2010 has not been made available in many European Union countries, with most European countries still lacking the legislation or the financing for large-scale VRS services, and to provide the necessary telecommunication equipment to deaf users. Germany and the Nordic countries are among the other leaders in Europe, while the United States is another world leader in the provisioning of VRS services. Videoconferencing on hand-held mobile devices (mobile collaboration technology) is being used in industries such as manufacturing, energy, healthcare, insurance, government and public safety. Live, visual interaction removes traditional restrictions of distance and time, often in locations previously unreachable, such as a manufacturing plant floor a continent away. A telepresence robot (also telerobotics) is a robotically controlled and motorized videoconferencing display to help provide a better sense of remote physical presence for communication and collaboration in an office, home, school, etc... when one cannot be there in person. The robotic avatar and videoconferencing display-camera can move about and look around at the command of the remote person. 1 2 Mulbach et al, 1995. pg. 291. ↑ Robert Stults, Media Space, Xerox PARC, Palo Alto, CA, 1986. ↑ Harrison, Steve. Media Space: 20+ Years of Mediated Life, Springer, 2009, ISBN 1-84882-482-3, ISBN 978-1-84882-482-9. 1 2 "Mr. Tobin has been awarded 15 patents in the past 40 years". WilliamJTobin.com. Retrieved 2011-05-18. ↑ "Entrepreneur of the Year Reveals Secrets to His Success". RTIR (Radio TV Interview Report). April 1, 2011. Retrieved 2011-05-18. ↑ George Ou. "High definition video conferencing is here". 1 2 3 Firestone, Scott & Thiya Ramalingam, & Fry, Steve. Voice and Video Conferencing Fundamentals. Indianapolis, IN: Cisco Press, 2007, pg 10, ISBN 1-58705-268-7, ISBN 978-1-58705-268-2. ↑ "PDS and Vidtel Enable Affordable, Cloud-Based, Interoperable Video Conferencing for Southeast Michigan Businesses". Information Technology Newsweekly. December 27, 2011. Retrieved February 19, 2014. ↑ Ralph Stair and George Reynolds (2013). Principles of Information Systems. Cengage Learning. p. 288. Retrieved February 19, 2014. ↑ Stacy Collett (January 30, 2014). "Facebook CIO Supports Video Calls to Preserve Employee Culture". CIO Magazine. Retrieved February 19, 2014. ↑ ""Cloud-Based Interoperability Platform for Video Conferencing" in Patent Application Approval Process". Politics & Government Week. May 23, 2013. Retrieved February 19, 2014. ↑ Nitin Pradhan (January 23, 2014). "Better Videoconferencing In The Cloud". Information Week. Retrieved February 19, 2014. ↑ Perlroth, Nicole. Cameras May Open Up the Board Room to Hackers, The New York Times online, January 22, 2012. A version of this article appeared in print on January 23, 2012, on page B1 of the New York edition with the headline: "Conferences Via the Net Called Risky". ↑ Van Meggelen, Jim. The Problem With Video Conferencing Archived January 4, 2006, at the Wayback Machine., 2005. ↑ Vertegaal, "Explaining Effects of Eye Gaze on Mediated Group Conversations: Amount or Synchronization?" ACM Conference on Computer Supported Cooperative Work, 2002. ↑ Computer vision approaches to achieving eye contact appeared in the 1990s, such as Teleconferencing Eye Contact Using a Virtual Camera, ACM CHI 1993. More recently gaze correction systems using only a single camera have been shown, such as. Microsoft's GazeMaster Archived June 22, 2006, at the Wayback Machine. system. ↑ Chapanis, A; Ochsman, R; Parrish, R (1977). "Studies in interactive communication II: The effects of four communication modes on the linguistic performance of teams during cooperative problem solving". Human Factors. 19: 101–126. ↑ SVC vs. H.264/AVC Error Resilience Archived August 10, 2009, at the Wayback Machine. ↑ SVC White Papers Archived January 4, 2010, at the Wayback Machine. ↑ Tokson, Matthew J. Virtual Confrontation: Is Videoconference Testimony by an Unavailable Witness Constitutional?, University of Chicago Law Review, 2007, Vol. 74, No. 4. ↑ Case Study: Hall County, Lifesize.com website. ↑ ODAE Pubs: 70-067 Archived February 9, 2011, at the Wayback Machine. ↑ Adena Health System Uses LifeSize High Definition Video to Bring Remote Specialists to Infant Patients (media release), LifeSize.com website, December 8, 2008. ↑ Van't Haaff, Corey. Virtually On-sight, Just for Canadian Doctors, March–April 2009, p. 22. ↑ UK Council on Deafness: Video Interpreting , Deafcouncil.org.uk website, Colchester, England, U.K. Retrieved 2009-09-12. 1 2 New Scientist. Telephones Come To Terms With Sign Language, New Scientist, 19 August 1989, Vol.123, Iss.No.1678, pp.31. 1 2 Sperling, George. Bandwidth Requirements for Video Transmission of American Sign Language and Finger Spelling, Science, AAAS, November 14, 1980, Vol. 210, pp.797-799, doi:10.1126/science.7433998 . ↑ Whybray, M.W. Moving Picture Transmission at Low Bitrates for Sign Language Communication, Martlesham, England: British Telecom Laboratories, 1995. ↑ Placencia Porrero, with Gunnar Hellstrom. Improving the Quality of Life for the European Citizen: Technology for Inclusive Design and Equality (Volume 4): The Public Swedish Video Relay Service, edited by: Placencia Porrero, E. Ballabio, IOS Press, 1998, pp.267–270, ISBN 90-5199-406-0, ISBN 978-90-5199-406-3. ↑ European Union of the Deaf, EUD.eu website. ↑ By Alison Diane, InformationWeek. "Executives Demand Communications Arsenal." September 30, 2010. Retrieved October 5, 2010. ↑ How We Work: Communication Trends of Business Professionals, Plantronics Inc., 2010. Retrieved October 13, 2010. ↑ E. Curry, B. Guyon, C. Sheridan, and B. Donnellan, "Developing an Sustainable IT Capability: Lessons From Intel's Journey," MIS Quarterly Executive, vol. 11, no. 2, pp. 61–74, 2012. ↑ Hogg, Trevor (26 March 2014). "Snowed Under: Chris Buck talks about Frozen". Flickering Myth. Retrieved 26 March 2014. ↑ Truax, Jackson (November 27, 2013). "Frozen composers Robert Lopez and Kristen Anderson-Lopez". Awards Daily. Retrieved January 4, 2014. ↑ Ziemba, Christine (March 3, 2014). "Disney's Frozen Wins Academy Award for Animated Feature". 24700: News from California Institute of the Arts. California Institute of the Arts. Retrieved March 23, 2014. ↑ Kit, Zorianna (November 26, 2013). "Awards Spotlight: 'Frozen' Director Chris Buck on Crafting Well-Rounded Female Characters". Studio System News. Retrieved March 23, 2014. ↑ Freeman, Michael, "How to stay connected while working remotely"
↑ Howell, Peter. The Lasting Appeal of 2001: A Space Odyssey, Toronto Star website, November 1, 2014; also published in print as "Forever 2001: Why Stanley Kubrick's Sci-Fi Masterpience Is More Popular Now Than In 1968", November 1, 2014, p. E1, E10. Retrieved November 2, 2014 from TheStar.com. Quote: "Public esteem and critical estimation of 2001 has grown steadily ever since, even as the title date has come and gone with very few of its far-out advancements having been realized — although.... innovations like iPads and Skyping have finally caught up with Kubrick's view of future living. [2001 actor] Lockwood marvels at how he's now able to Skype his wife and daughter, just as he does his movie parents in the space-to-Earth communication scene in 2001." ↑ Solomon Negash, Michael E. Whitman. Editors: Solomon Negash, Michael E. Whitman, Amy B. Woszczynski, Ken Hoganson, Herbert Mattord. Handbook of Distance Learning for Real-Time and Asynchronous Information Technology Education, Idea Group Inc (IGI), 2008, pg. 17, ISBN 1-59904-964-3, ISBN 978-1-59904-964-9. Note costing: "....students had the option to install a webcam on their end (a basic webcam costs about $40.00) to view the class in session." ↑ Lawson, Stephen. Vidyo Packages Conferencing For Campuses, IDG News Service, February 16, 2010. Retrieved via Computerworld.com's website, February 18, 2010. ↑ USA Today. "Video Chat Growing by Light-Year Leaps", USA Today, March 31, 2010, p. L01d. Mulbach, Lothar; Bocker, Martin; Prussog, Angela. "Telepresence in Videocommunications: A Study on Stereoscopy and Individual Eye Contact", Human Factors, June 1995, Vol.37, No.2, pg.290, ISSN 0018-7208, Gale Document Number: GALE|A18253819. Accessed December 23, 2011 via General Science eCollection (subscription). Hoffman, Jan. When Your Therapist Is Only a Click Away, The New York Times, September 25, 2011, pg. ST1. Also published September 23, 2011 online at www.nytimes.com. Updated on October 2, 2011. Lawlor, Julia. Videoconferencing: From Stage Fright to Stage Presence, The New York Times,August 27, 1998. ProAV Magazine. Being There ProAV Magazine. 7 November 2008. Naesys, India. Video Conferencing Software, January 12, 2015.